The visit started with a vineyard tour. Björn Probst then showed us the plans for a new winery that will be built in the next years on the grounds of Kloster Pforta a few miles away from the current location of the winery. He then showed us the cellar of the current winery which will continue to be used until the new winery is ready. We then went to the tasting room for a tasting. We ended the visit with a self-guided tour of the Pforta Abbey, where the new winemaking facility will be built. 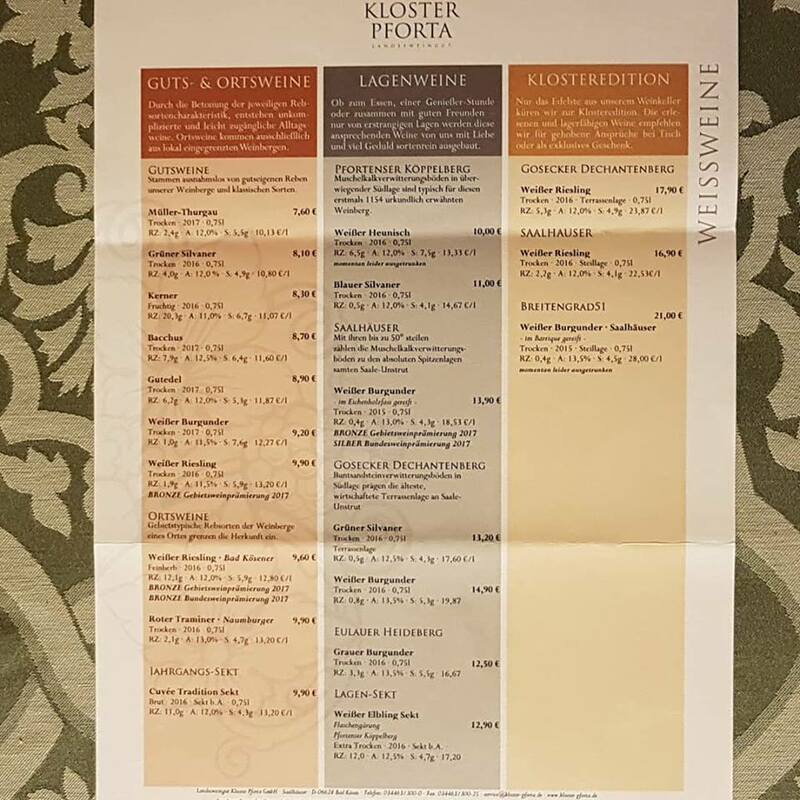 Landesweingut Kloster Pforta is one of the five State-owned wine producing estates in Germany, and is owned by the State of Sachsen-Anhalt. Its history mirrors German history. 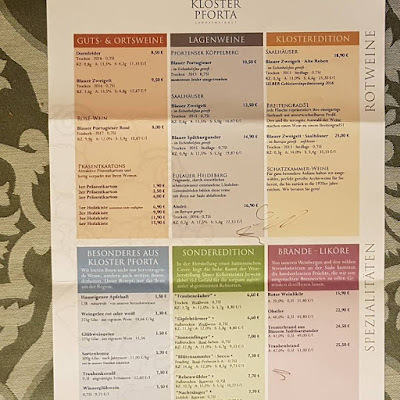 Its origins date back to the Pforta Abbey, founded in 1137 by Cistercian monks (one year after the founding of the monastery Eberbach in the Rheingau). In 1154 the monks started to plant vines in the Pfortenser Köppelberg vineyard, which still today is one of the six vineyards of the winery, producing excellent wines. Pforta Abbey soon had a reputation as the richest abbey in medieval Thuringia, with vineyard holdings in 192 communes, totaling at least 250 ha (around 625 acres). The end of the monastery came in the 16th century with the Reformation. After Reformation (during the 16th century the eastern part of Germany became Lutheran and the monks had to leave), ownership went to the kings of Saxony, which subsequently lost the Abbey Pforta to the Kingdom of Prussia at the Vienna Congress in 1814. After World War II, it became the socialist co-operative VEG (volkseigener Betrieb / company owned by the people) Weinbau Naumburg in the GDR, with 300 acres of land. After the fall of the Wall in 1989, Abbey Pforta was in the hands of the privatization organization Treuhand for a few years, but privatization efforts were not successful and thus the State of Sachsen-Anhalt took over in 1993. Today, the vineyards total 55 hectares in the Gosecker Dechantenberg (monopoly ownership), Pfortenser Köppelberg, Eulauer Heideberg and Saalhäuser (steep-slope and monopoly vineyard in Bad Kösen). They are planted with the white wine varieties Müller-Thurgau. Sylvaner. Riesling, Pinot Blanc, Red Traminer. Bacchus. Kerner, White Gutedel ( Chasselas ) Blauer Silvaner, Elbling, Heunisch ( Gouais blanc ) and Pinot Gris as well as the red wine varieties Blauer Portugieser, Zweigelt, Pinot Noir, André and Dornfelder. Bottle-fermented sparkling wines and brandies are also produced (pomace, grape, fruit). Pforta Monastery is a member of "Latitude 51" ( terroir-oriented Saale-Unstrut Winzer) and Generation Riesling. Björn Probst has been Managing Director and Winemaker since late 2017. Earlier in 2017, we had met him at Weingut Fürstlich Castell’sches Domänenamt in Franken. He was in Franken for about 2 years. 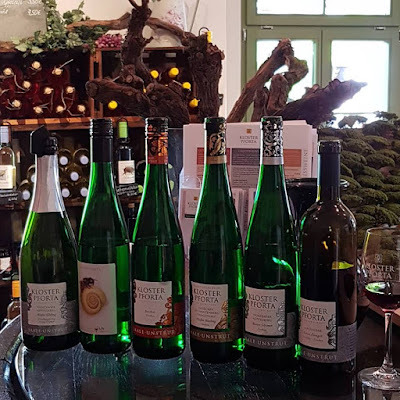 Before joining the Weingut Fürstlich Castell’sches Domänenamt, he was running Weingut zu Weimar and Weinhaus zu Weimar in Sachsen, owned by Georg Prinz zur Lippe. Born in Cologne, he studied at the Geisenheim University. We tasted 6 wines with Björn Probst. Thanks Björn for the wonderful visit. We ended the visit with a self-guided tour of the Pforta Abbey, where the new winemaking facility will be built. 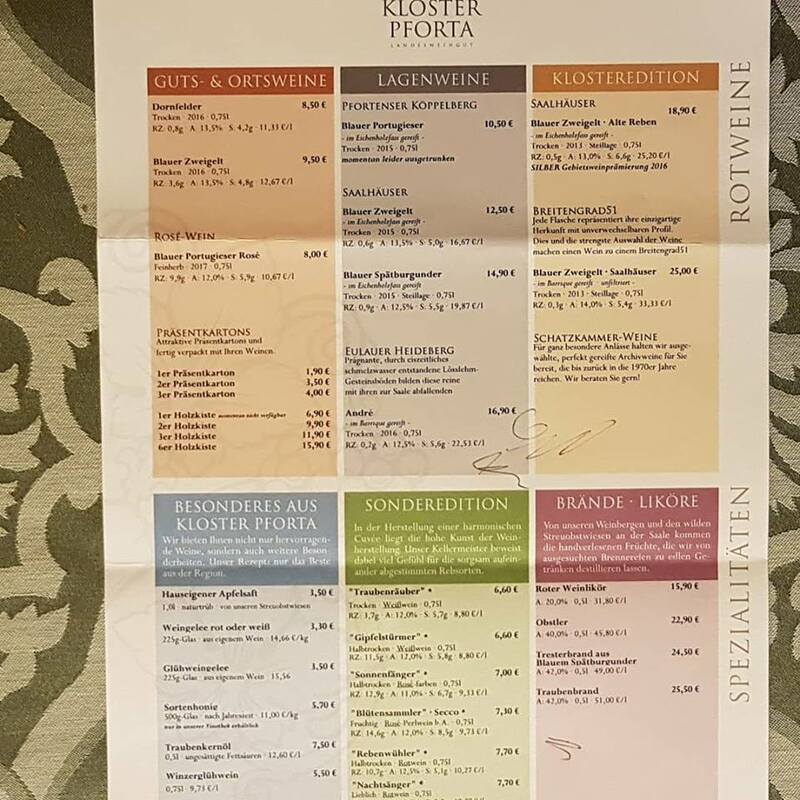 After the visit of Weingut Kloster Pforta, we drove to Leipzig for lunch. Leipzig lies at the confluence of the rivers White Elster, Pleisse and Parthe. There is a system of connecting waterways –canals- in the former industrial area of Leipzig-Plagwitz. There are several charming restaurants sitting on the banks of the rivers and canals. The history of Château Clos Fourtet goes back as far as the Middle Ages, some even say to Roman times. 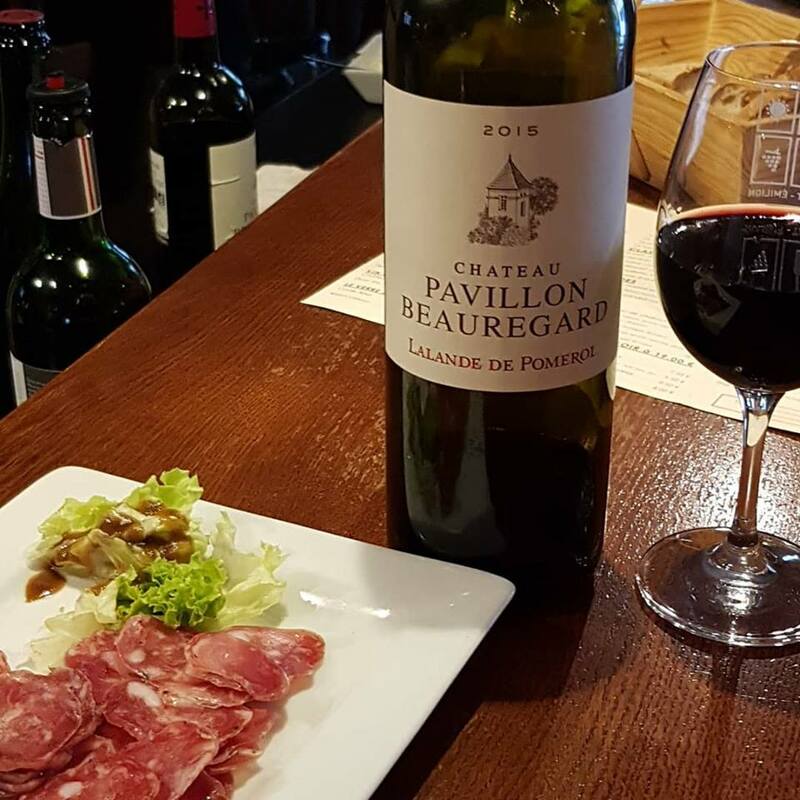 A defensive settlement was built to protect the town of Saint-Emilion and at the site of Clos Fourtet a military camp was constructed. From the 17th to the 19th century what is now Clos Fourtet was known as Campfourtet. The first vines were planted in the 17th century. The estate changed hands several times. In 2001 it was purchased by Philippe Cuvelier, a wealthy businessman from Paris. 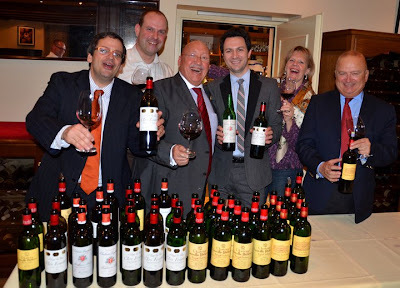 Today his son Matthieu Cuvelier is running the estate. He hired Stéphane Derenoncourt as oenological consultant. Stéphane Drenoncourt is also consultant at Boxwood winery in Middleburg, Virginia. Château Clos Fourtet is located at the entrance of Saint-Emilion and the vineyards are just outside of town starting on the limestone plateau, on which Saint-Emilion sits, and slope down to the plains of clay to the west. The 20 hectares of vineyards are planted with 85% Merlot, 10% Cabernet-Sauvignon, and 5% Cabernet-Franc. For centuries, the ancient ‘Camp Fortet’ (small fort) with its modest profile has overlooked the historic town of Saint-Émilion, peacefully surveying it in times of prosperity, protecting it in times of war. The 20-hectare vineyard forms a single plot, planted upon the highest slopes of Western Saint-Émilion. Constructed from the very rock upon which it stands, the chateau and its surrounding wall (hence ‘clos’) are intimate and unassuming. Ever since the beginning of the classification in 1956, Clos Fourtet has been a member of the elite ‘Premiers Grands Crus Classés’ of Saint-Émilion. The vineyard is situated upon the summit of Saint-Émilion, where limestone soils offer superb drainage. This predominance of limestone brings inimitable freshness to the wines, with minerality and delicate tannins. The result is wines with a strong identity that is dear to passionate enthusiasts who talk of a ‘Clos Fourtet style’. We work gently, at one with the nature that surrounds us, to support and nurture our soils. A cavernous 13-hectare underground cave network weaves far and wide beneath the vineyards of Clos Fourtet, with a mysterious, elusive history of its own. Dark and sombre, still and untarnished, the vastness of this limestone enclave is hidden 6 to 12 metres below the earth. A natural cellar, it is as functional as it is aesthetic. This sanctuary breathes pure air, which circulates to create an exceptional natural climate for the 250 barrels and 100,000 bottles that rest beneath the earth. The wines of Clos Fourtet, Premier Grand Cru Classé, embody the finest of Saint-Émilion. Smooth, intriguing and seductive, their pure natural aromas are delicately woven together in a charming display of the unparalleled potential of our terroir. 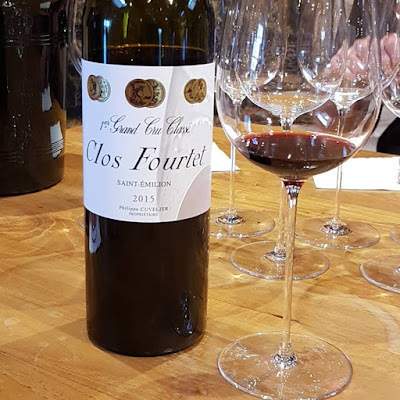 Wine Advocate-Parker : Medium to deep garnet-purple colored, the 2015 Clos Fourtet has lifted menthol notes on the nose over a core of chocolate-covered cherries, dried mulberries, baked plums and potpourri plus a touch of cloves. Medium-bodied and very firm with lovely ripe, fine-grained tannins and plenty of freshness, it finishes long and perfumed.